The exhibition has always been about grabbing the audience's attention. VR is a good medium for this, since a visitor can be transported to a virtual environment and receive a persuasive virtual walk & talk without any distractions. And in doing so, the willing visitor becomes an attraction of its own for the remaining audience: a character who's in another reality, totally unaware of his surroundings. Bringing VR to a broad audience remains a difficult task. Not every household wants to spend their savings on expensive hardware to bring an individual experience inside the living room. And having a VR-set at home doesn't have the same social attraction as being the first guy in the street with a television. Conclusion for now: you shouldn't try to reach your VR-audience at home (yet). Instead, reach out to them in public spaces. Flashback to the arcade halls – let a group of friends play a game in the same public space, grab a soda and yell at each other, and you've got yourself a social event based around gaming. The same rules can be applied for Virtual Reality. That's the idea behind BeVirtual: bringing an experience centered environment where everybody – children, youths and elders! – can taste a bit of Virtual Reality. Each in its own physical play area but all in the same shared space (both virtually and physically). Taste a bit of VR at BeVirtual in Ghent! The user should have the feeling they're good at your experience. The inability or unwillingness of the user to continue your experience will be the noise on your message. Therefore the experience must be self-explanatory and not too demanding. It's the thin line between a VR experience and a VR game. World Browser – an interactive experience in which you discover (y)our key values. "Cutting a rope and shooting some fireworks… that makes up for a rather short experience! ", we thought, so we took the opportunity to extend the experience. After the rope is cut, a platform rises in front of our visitor. We invite the guest to take a leap of faith by walking on the platform and conquer the fear for heights. If he's willing to surrender himself to the virtual world, we bring him to our hall where he can visit our virtual stands. Siegfried Bracke opening the Advanced Engineering 2018 in Flanders Expo Ghent by cutting a virtual rope. 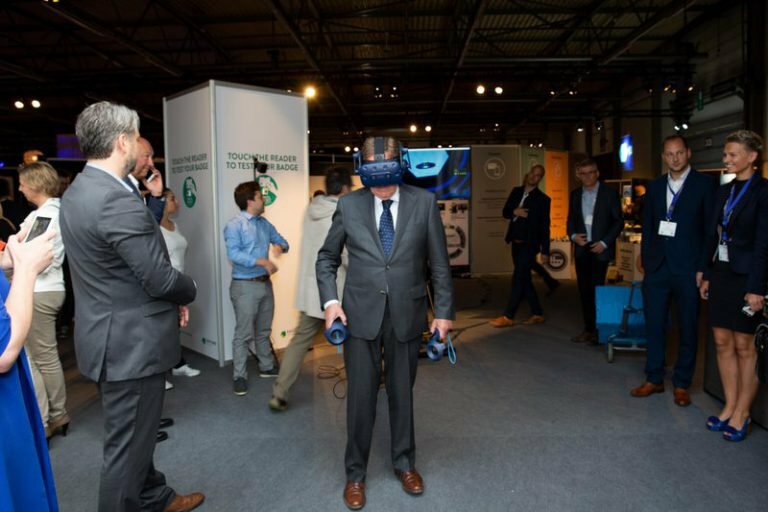 The experience was created by Holofarm and hosted by BeVirtual (image: Easyfairs Belgium). This experience has a linear flow: it invites the viewer to interact with the environment to continue the story. The benefit of this linear approach is that every visitor will see the same content in a similar time-frame (2 to 3 minutes). This play-length is something that has to been taken into account from the start when developing an experience. Know up front how long you want keep a visitor inside VR. If you want to create an experience that can be visited very quickly (e.g. 2 minutes) and also offers content for a longer play-through (e.g. 30 minutes), then it's a good option to give the possibility to browse. Discovering the content at your own pace will give an elastic flow to your experience. The example below, an interactive VR-experience for M – Museum Leuven, illustrates how VR can be used in a museum context to give the audience a refreshing way to dissect a painting. The project was handled in the same way a website is developed. We started with a flowchart and created branches for the 3 major categories (Zodiac, months and planet children). Each category has its own view. In zodiac mode, you see figures in the sky around you. When browsing the months, a part of the painting comes closer to you in parallax. And the planet children show fragments of the painting while the corresponding planets fly around you in orbit. In the meantime, a narrator gives the user more insights. This non-linear approach resulted in an experience that is more about exploring instead of building up a story. Our statistics showed that most visitors spent 3 to 5 minutes inside this VR experience, but around 15% of the visitors spent more than 20 minutes inside it. The maximum play-through was 42 minutes: a visitor who took the time to discover it all. Let's do a fictional breakdown of a project. Company IT Buster sells IT-services. You want to tell your potential clients that you're the guy to protect their computer network. The expo is coming up and you want to gain some attention from potential clients. The user is prompted to slam the virus with the controller before it duplicates itself. When the situation gets out of hand after a minute, the user gets a 'game over' and we see the logo of IT Buster fading in, while hearing a voice-over: "Prevent situations like these with IT Buster!" Option A, the virtual visit, does not have a clear message and does not take advantage of being in a fictional world. In contrary: it's a replica of a real environment. It can easily cost +50 K euro since the creation of photo realistic 3D still remains expensive. If the company would extend or replace its facilities, the experience will become outdated. But eventually it can offer an exclusive experience where users can wander around in places where they not permitted to in real life. If you want to take your users to a 'real' place and show that you care about production value and style, go for option A. If you want to offer a break from reality and keep it cost efficient, we would suggest option B. Don't assume your team is going in the right direction. But let your audience try it early on. To measure is to know. Only then the experience will become something the user wants, instead of what you (think they) want. Previous Previous post: Hey, you! Holograms for everyone!